I was a chubby kid, I’ll admit it. I was teased at school about my weight, and it hurt my feelings deeply —I’ll admit that too. If it wasn’t for me being a chubby kid, though, I am not sure I would be where I am today. While I don’t condone fat shaming or bullying others about their appearance, my experience being chubby motivated me to learn about nutrition and exercise. I began by researching things on my own, exercising at the YMCA, and eventually became a Pilates instructor in my senior year of high school. This self study allowed me to understand the value of healthy food and I felt better when I adopted a healthy eating style. When I entered University, I had no idea what I wanted to do, so I just enrolled in a bunch of different classes. One of them happened to be nutrition. What I didn’t realize at the time was that nutrition was a program of its own that I could major in! Nutrition was what I was passionate about, so it was instantly clear to me that this was what I was going to study. I was not only excited to learn even more about nutrition and nutrient biochemistry, but also about the idea of being able to share this with others as a dietitian. “Your tests look great.” For me, this wasn’t an answer — it was the exact opposite. I know that many people share this frustration, and it’s one of the most common reasons people seek out a naturopathic doctor. It was no different for me as a patient. One of my sister’s friends recommended that I visit the naturopathic doctor she was seeing, and I did. The first visit was the most refreshing healthcare experience I had ever had. It inspired hope in me. I knew that there was someone out there who looked at the body differently, and did not see me as just my test results or symptoms. I won’t lie and say all my digestive issues disappeared on that first visit. What I can say though is thatsomeone began to teach me about how my body worked and how my diet, emotions, environmental exposures, and gut flora impact my digestive system. This was another pivotal experience that lead me to where I am now. After my visit to the naturopathic doctor, I began to understand that as much as people want to generalize and put foods into two categories — “healthy” and “not healthy” — it is not that simple. Each person has a different body which responds to some foods well, and others not so well — even the “healthy” ones! Food recommendations cannot be cookie cutter; they must be individualized to each person. At this point, I was three years into my nutrition and dietetics program and still very interested in what I was learning, which was nutrition biochemistry and calculating micronutrients for patients being fed by IV. It wasn’t until the final year of the program that I knew I had to change gears; this was the year we began clinical work, using the “Canadian Food Guide” as our primary resource. I was astounded that all this intensive, biochemical knowledge of nutrition was being boiled down to something like the Food Guide. I couldn’t come to terms with it. I looked at the guide, and if I ate five slices of bread, canned beans, a banana, tomato sauce and some milk and cheese, apparently I was following its recommendations. This was so far from the philosophy of individualized nutrition that I had come to embrace. I wanted to be at the forefront of people’s health and be in a position where I could help make drastic improvements in people’s lives. I knew nutrition was a big part of health, but I knew there was more I needed to know. This was when I decided to become a doctor. 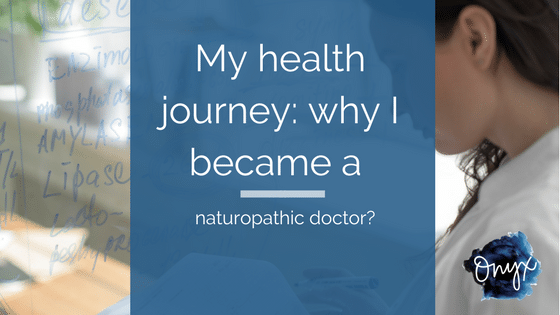 In the beginning, I didn’t fully understand that naturopathic doctors were medically trained doctors or the extent of what they do. As I looked more into the four-year doctorate program, I became more and more excited about the approach to healthcare they embodied. I applied for — and was accepted into — the Southwest College of Naturopathic Medicine and haven’t looked back. I still credit my nutrition biochemistry professors with my love and in-depth knowledge of human biochemistry. I always look at every health issue from a biochemical standpoint which allows me to understand where symptoms are coming from and how to address them. If it wasn’t for the succession of experiences I had, I might not be where I am today. I feel excited and blessed to do the work I do, with allows me to make a positive impact on people’s health journeys.